Modern Mormon Men: How Many Handbook Rules Does It Take To Remove God From A Mormon Baptism? How Many Handbook Rules Does It Take To Remove God From A Mormon Baptism? I baptized our two youngest sons two weeks ago. Noah had turned eight a week earlier, and our recently adopted nine year-old son, Jonathan, wanted to get baptized on the same day as Noah. The service turned out to be a special experience for our family, it just wasn't what my wife and I had initially envisioned when we'd started planning the baptism a few weeks ago. Weather in Seattle during the end of May / beginning of June is wonderful, so one of us suggested an outdoor baptism. We have friends who live on the Puget Sound and have a large hot tub overlooking the beach. Could we do it there? "Absolutely," our friends said. We talked about how we wanted the service to feel authentic to where our family is in our faith journey. The last five years have seen major changes in how we approach religion and the church - I've become less orthodox in my beliefs and my wife has been attending a non-denominational Christian church for almost two years. 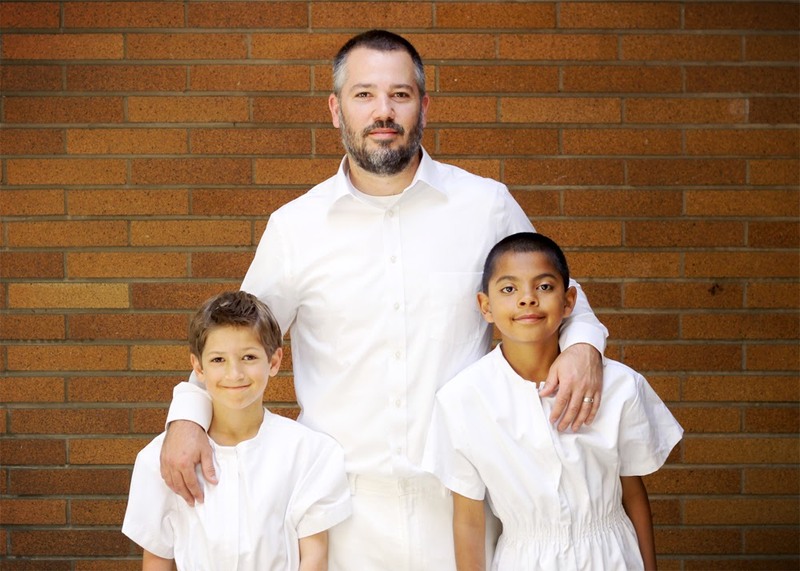 As a result of these changes, we wanted the baptismal service to focus more on how baptism is a commitment to follow Christ and less on how the boys were joining the mormon church. So we called one of our closest friends, who now lives in the Midwest and is a non-denominational youth pastor whose approach to Christ we value and respect, to see if he'd attend and briefly speak on what committing to Christ means to him. "I'll buy a plane ticket," he said. We wanted a private gathering of only family and a few friends, so chose not to announce the baptism in sacrament meeting. I bought a new white shirt for the ordinances. The kids had their interviews with the bishop (with my wife in attendance). And then, a few days before the baptism, the battle with the Handbooks began and we felt God being removed from the preparations. An outdoor baptism? Section 20.3.5 of Handbook 2 states: "When a baptismal font is not available, any body of water that is safe may be used for a baptism ...," and since the font was available, we were told to change plans and perform the baptisms in the font at the church. Who is this pastor friend from the Midwest? Section 21.1.20 of Handbook 2 states: "For most Church meetings, speakers and instructors should belong to the local ward or stake. The bishop's approval is required before guest speakers or instructors may participate in any ward meeting, including auxiliary meetings. The bishop or stake president carefully screens guest speakers or instructors and the subjects of their presentations." Don't you find the choice to have him speak a little odd? Jonathan is nine years-old? We can't authorize the baptism, the local mission president must as he's considered a new convert. You'll need to scramble to have the missionaries review the discussions with him (Zone Leader: What does the word of wisdom say we shouldn't put in our bodies? Jonathan: Soda? ... my wife smiles and gives Jonny a thumbs up. Zone Leader: Jonathan, do you keep the law of chastity? Jonathan: Huh? ... my wife shakes her head at the ridiculous question). Good luck working these interviews in around school, baseball, scouts and the family you have in town FOR THE BAPTISM. Our bishop and stake president literally lost sleep helping us navigate the Handbooks to come up with a favorable solution (which they did, we're at peace with how the service went down), but still … the entire experience left us shaking our heads … and I imagine God was shaking his head too.